When it comes down to it, there are really two kinds of VPNs: those that promise an unbelievable number of country connections and those that don’t. This review is looking at a service of the latter type. 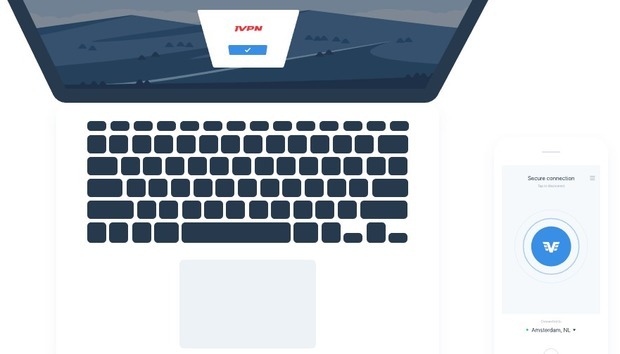 IVPN is a small service officially based in Gibraltar that offers what you need in a VPN, including the right privacy promises, excellent speeds in at least some regions, and an easy-to-use Windows app. The company’s mobile support for Android could use a little more work, but no service is perfect. IVPN’s Windows app is very basic when you first fire it up. Similar to other VPNs such as Mullvad it uses a small single-pane window. There are only two tabs in the window: Single Hop and Multi Hop. 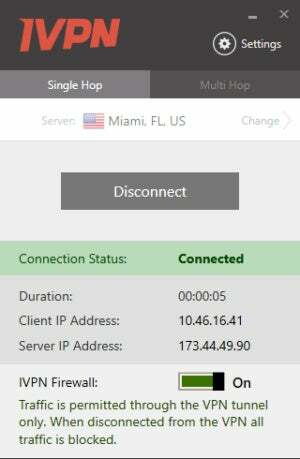 If you’re not familiar with Multi Hop, it’s a feature that allows you to connect through two VPN servers instead of the usual one, to further obscure your IP address. Using the Single Hop option is simple enough. You click on the Server panel at the top of the tab to change the location if need be, and then click Connect. 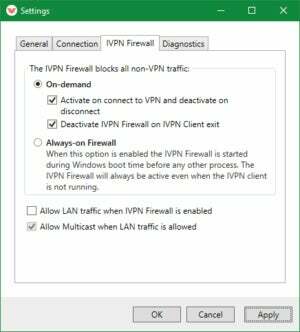 Once you start connecting, IVPN has a firewall setting that will block all internet traffic should the VPN drop its connection. Otherwise all internet traffic goes through the VPN. 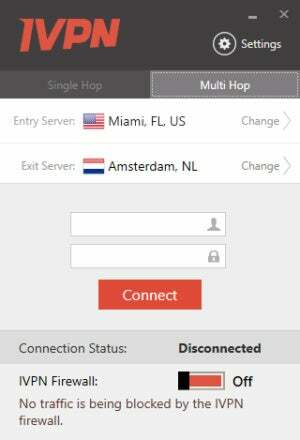 Multi Hop lets you route your internet connection through two servers instead of one. 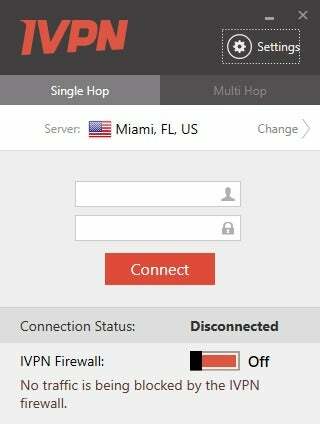 Multi Hop works pretty much the same except that instead of choosing one server you choose two. One is marked as the entry server—the server you connect to first—and the other is the exit server. The exit server is the one where you connect with the wider internet and its location is where your traffic will appear to be coming from. IVPN’s settings, available from the top-right corner of the window, don’t offer a ton of options. The General tab has some basic settings such as starting at login (not enabled by default) and the option to automatically connect to the last server on startup. There’s also an option to automatically connect to the server you last used when you’re on an insecure Wi-Fi network. The Connection tab lets advanced users specify UDP or TDP protocols and ports. 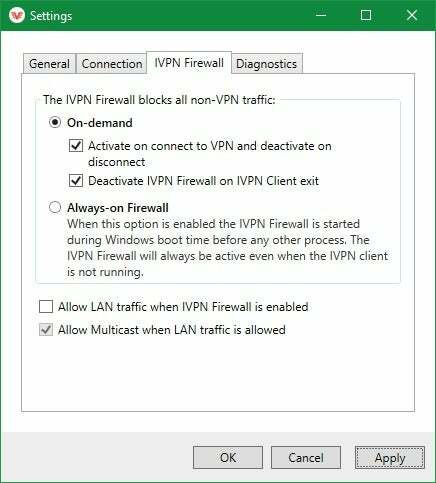 IPVPN Firewall gives you an option to have it “always on,” which means that when the program is active, it will block all internet traffic even when not connected to the VPN. If you’re going to use that option make sure you also tell IVPN to start at login under the General tab. Finally, the Diagnostics tab lets you enable logging should you need support help from IVPN. That’s all there is to IVPN’s Windows app. It’s incredibly simple, without a lot of options. One annoyance I had with it is that the program cannot be dismissed from the taskbar without shutting it down. That means that as long as your VPN connection is active IVPN has to sit on your taskbar despite the fact that there’s also an icon in the system tray. IVPN also offers apps for Mac and iOS, as well as instructions for how to set up the VPN on Linux, Android, routers, and NAS boxes. IVPN also has a nice guides section with helpful information, including how to do a VPN leak test and how to set up IVPN on a Raspberry Pi. IVPN’s app with an active connection. IVPN’s overall speed score was only about 33 percent of the base speed, but that doesn’t tell the whole story of its capabilities. The service has some of the best speeds we’ve tested for U.S and UK connections. The U.S. connection was 55 percent of the base speed, while the UK connection was 74 percent. Other areas weren’t so strong. The German connection was surprisingly weak. Most other VPNs have fast speeds out of Germany, but IVPNs at the time of our testing was the second slowest. Hong Kong was pretty good at nearly 20Mbps, and Iceland (standing in for the lack of an Australian server) was lethargic, not even breaking 3Mbps in our test. If you need an Icelandic server IVPN may not be for you, but if you’re only interested in speedy UK and U.S. servers IVPN is well worth looking at. Similar to many other VPNs, IVPN only asks for your email when signing up. This requirement tries to strike a balance between knowing as little as possible about you, while having enough information to keep you engaged as a customer. It’s not the gold standard that Mullvad achieves by knowing nearly nothing about you, but it’s not bad. If you need the best anonymity possible don’t use one of your primary email addresses when signing up. Once you’re signed up, IVPN assigns you a nondescript username using a combination of letters and numbers for connecting to the VPN. Your email, meanwhile is used to sign in to the web area where your account details are. The password is the same for both. Payment options include credit cards, PayPal, Bitcoin, and cash. Most of those are run-of-the-mill for VPNs, with the exception of cash, which is rarer but not uncommon. These options allow you to pay with varying levels of anonymity, depending on your comfort level. IVPN’s mailing address is Privatus Limited, 5 Secretary’s Lane, Gibraltar, GX11 1AA, according to the company’s Terms of Service page. The company’s CEO is Nicholas Pestell and the chief technical officer is Fedir Nepyivoda. Other members of the team appear on the company’s about page, but without last names. Although the company’s offices are in Gibraltar, the team appears to be spread out through the world. A number of employees appear to be based in Ukraine based on some basic searching on LinkedIn. The holding company behind IVPN is called Privatus Limited as noted above in the mailing address. When you visit the company’s website it uses the Piwik analytics platform—self-hosted on its server—to gather information about website visits. This includes information about your browser user-agent, system language, screen resolution, referring website (link you clicked to get to the website), IP address, and other information. IVPN says it “discards the last two octets” (16 bits) of your IP address to reduce the amount of information it has about you. Overall, IVPN’s trust level is not bad. A few months ago there was a discussion on Reddit about IVPN’s desktop program EULA, which said that any disputes over the service would be handled in a Texas court. That suggested the company was based in the U.S., and not Gibraltar. That problem has since been changed and the EULA clearly states disputes will be settled in the EU.